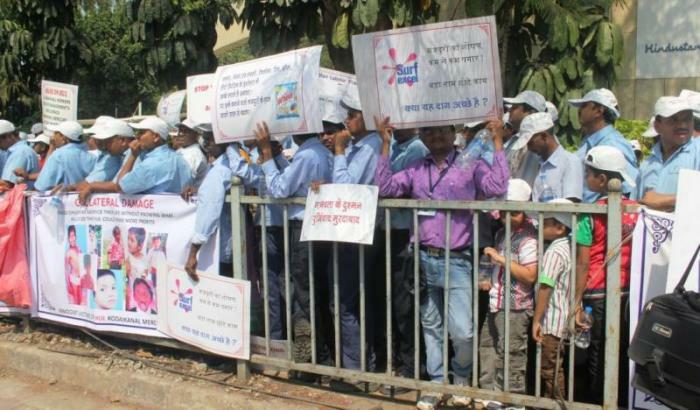 Employees from Hindustan Unilever Limited’s two factories in the union territory of Dadra and Nagar Haveli were in Mumbai to protest outside the company’s headquarters at Chakala, Andheri (E). Over 500 employees, working at the company’s Dapada and Amli plants, along with their families, were a part of the demonstration held on Friday. Hindustan Unilever is one of the biggest transnational companies, headquartered in Mumbai. The company manufactures over 35 brands spread over 20 product categories, ranging from tea to skin care products. HUL had earlier courted controversy over its thermometer manufacturing factory in Kodaikanal. Thermometers use the highly toxic liquid metal, mercury. As a result of contact with the toxic metal, workers suffered memory loss, neurological and kidney disorders, among others. Several women employees of the factory gave birth to severely deformed babies as a result of mercury poisoning. HUL is yet to take responsibility of the incident and compensate the employees.